Join the discussion on our forums! Come discuss Spirit of the Rhino over in our dedicated Spirit of the Rhino discussion topic. Stealth for 1 Turn. Your Rush minions are Immune the turn they're summoned. Where did they get this preposterous hypothesis? The best thing about this totem compared to the others is that its 1 mana, making it really easy to work with. I wonder how this interacts with rush minions that are summoned on your opponent' turn? Say you Cube a Darius or something with this one the board and your opponent pops the cube...Will the two Darius be immune on your opponents turn? Yeah, if the text on the card is accurate, they are immune on your opponent's turn. Your opponent's turn == turn they're summoned. And it's summoned, not played. what is with Dr. Boom. Are the mechs then rush minions and have this effect? I'd assume not, as this targets ''rush minions'', previous cards like N'Zoth, the Corruptor which had an effect on deathrattle minions didn't affect ones that had been given a deathrattle effect. Rush Warrior is playing well against aggro and was pretty good, still not popular. for such a powerful effect this is extremely cost efficient. You are almost guaranteed to get value out of this twice since you can just play it with any rush minion ont he same turn and still have it up the next. Even better is the fact that Rush Warrior has a supreme 1-drop in Town Crier already and no really valuable rush 2-drops so nobody needs to feel tempted to play this turn 1. Very good card for 1 mana. This can push rush warrior archtype from control to midrange. It protects your rush minions and your rush minions protect it. This way it can stick to the board for couple of turns or your opponent needs to spend removal on a 1 drop that already generated value! 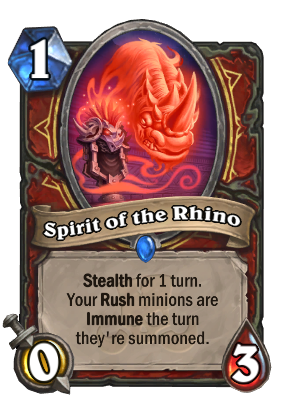 This is why I think Spirit of the Rhino will be very good. I think it can even make Rocket Boots playable. Meta defining in my opinion. And that's what we can call a spirit! DAMN! It does make Rush the best mechanic warrior can use. It will make a great deck!